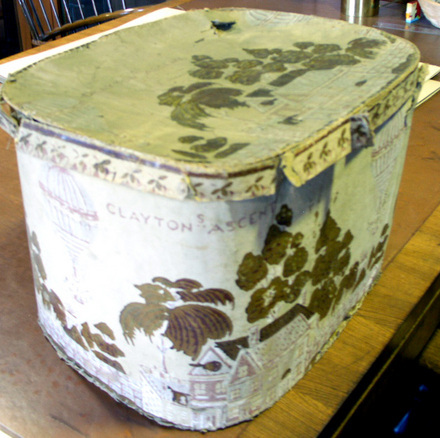 The American bandbox is traditionally made from curved and sewn paste-board, covered with decorative wallpaper and sometimes lined with newspaper. These inexpensive storage boxes were made in all shapes and sizes and used to house all types of clothing and objects. They were sometimes created with designs connected to an event or holiday. The first flight in a hot air balloon to exceed 500 km (311 miles) was made on April 8, 1835 by Richard Clayton, an aviation enthusiast. Clayton left from a Cincinnati, Ohio, amphitheater and landed nine and one half hours later in Monroe County, Virginia. 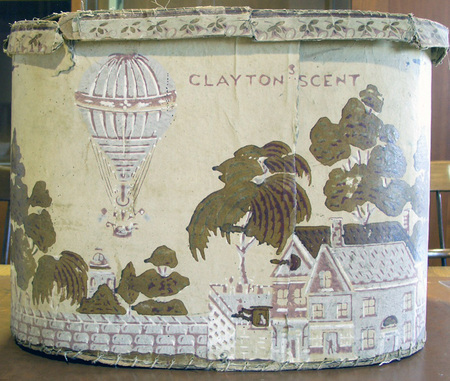 To celebrate this event, a bandbox was created with printed wallpaper showing Clayton’s balloon ascending over the Ohio countryside and the word’s Clayton’s Ascent on the cover and sides. The series was probably marketed soon after the flight in 1835 or 1836. This bandbox comes with a handwritten note stating, “Purchased July 1931 from Frank McCarthy, Longmeadow, Mass. … $17.50. 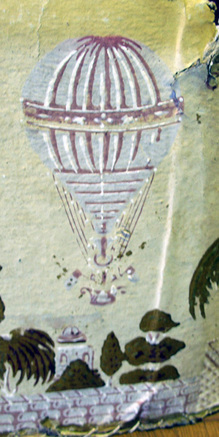 It is part of the Aeronautical collection collected by Harold Fowler McCormick, Class of 1895, and given to Princeton University by Alexander Stillman of Chicago, a relative of the McCormick family.